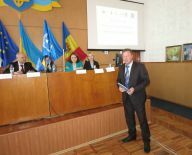 On 21-24 January 2015 representatives of local self-government bodies, UNDP Moldova, Nongovernmental organizations from the Republic Moldova visited Vinnytska oblast, Ukraine. An exposure visit was organized in terms of cross-border cooperation between Republic Moldova and Ukraine under the joint support of UNDP in Moldova, Institute for Development and Social Initiatives in Moldova «Viitorul» and Vinnytsia oblast implementation unit of the joint EU/UNDP Project “Community Based Approach”. The visit was designed share experience and to learn best practices in the implementation of projects by Ukrainian local self-governments. During the event participants visited 4 CBA partner-communities: Antonivska, Halzhybiivska, Dovzhotska and Tomashpilska village councils. Representatives of Moldavian local self-governance learned experience of community self-organisation and visited the objects of local social infrastructure which were repaired jointly by communities with CBA Project. Delegates also participated in the work meeting about implementation of joint Operational programme for territorial cross-border cooperation of Moldova and Ukraine in Tomashpilsky rayon under participation of representatives from Chechelnytsky, Yampilsky and Barsky rayons. Participants shared their own experience and discussed perspectives of further cooperation. The programme of territorial cooperation is aimed to develop cross-border cooperation between local self-government bodies, communities and civil society organisations to jointly address the issues of social and economic development. The programme is aimed to improve living conditions of local communities in border areas through joint projects for social and economic development.